A religious martyr is a person who is killed as a result of maintaining and practicing religious faith. In the early years, of the Christian faith in Korea, several thousand Christians, most of them Roman Catholics, were martyred. The Catholic faith started to develop in Korea at the beginning of the seventeenth century, during the Joseon period, a time when outside influence of any kind was not welcomed in Korea. 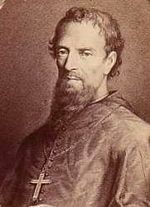 Catholicism was seen as a threat to the state ideology of Confucianism, and many Catholic monks, priests, and lay members were executed, producing as many as 8,000 or more martyrs. The Roman Catholic church began to develop in Korea at the beginning of the seventeenth century, brought by Koreans who had met the faith and been converted in China. They also brought translations of the scriptures from China, and the strong and dynamic Catholic communities were led almost entirely by lay people until the arrival of the first Catholic missionaries from France in 1836. The Protestant churches did not start sending missionaries until nearly 50 years later, in 1884. The Catholic community suffered major persecutions in the years 1839, 1846, and 1866, producing at least 8,000 known martyrs, killed for following a false religion. Among them were the fervent Korean priest Andrew Kim Taegeon and the Korean lay catechist Paul Chung Hasang. The vast majority of the martyrs were simple lay people, including men and women, married and single, old and young. The members of this group of martyrs have been canonized as saints, with feast day September 20. 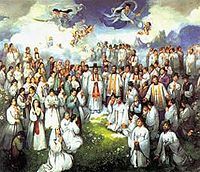 Currently, Korea has the fourth largest number of saints in the Catholic world. Robert Jermain Thomas (1839-1866), a Welshman, is the first Protestant missionary on record to have visited Korea, arriving in 1865, to distribute Chinese Bibles, about 20 years before the first organized Protestant evangelists began work in Korea. He returned to Korea again in 1866, on the General Sherman officially as an interpreter, continuing to also distribute Bibles. He was executed along with the rest of the ship's crew when the ship sailed too close to Pyongyang and was attacked by Korean forces. Thus, he became the first Protestant Korea martyr in Korea. Many other Protestant missionaries and laymen were killed during the Japanese occupation. Many of the political activists killed during the March 1 Movement in 1919 were Christians. They are better described as political martyrs than religious martyrs, because they were killed as a direct result of their participation in political activism. From that time on, the Japanese occupation government was increasingly suspicious that any Christian might have political motives, and many Christians were imprisoned, tortured and killed. At the end of the Korea War, there were an estimated 300,000 Catholics in North Korea, including a number of Benedictine monks. Today, according to Pyongyang, the number of Catholics in North Korea is less than 5,000. At the end of the war, some fled to the South. Others were killed, or gave up their faith. It is impossible to know how many became martyrs. 36 members of the Benedictine order associated with Tokwon Abbey in North Korea have been confirmed as killed by the Stalinist regime between 1949 and 1952, when they refused to abandon their faith. The 36 have been recommended for sainthood, and the Order of St. Benedict Waegwan Abbey in South Korea is working to move the process of their beatification and canonization forward. Although the history of Catholicism in Korea is relatively short, as a result of the brutal persecutions of the church by the Joseon court, the number of martyrs is quite high, and Korea has the fourth largest number of Catholic saints of any country in the world. Pope John Paul II broke with tradition and held a canonization ceremony in Seoul, bestowing sainthood on 103 of the Korean Martyrs. The courage and sacrifice of the Korean Catholic Church is well known outside Korea, and there are more than a dozen Catholic Churches in North America bearing the name Church of the Korean Martyrs. Now, however, some fifty or sixty years since holy Church entered into our Korea, the faithful suffer persecutions again. Even today persecution rages, so that many of our friends of the same faith, among whom am I myself, have been thrown into prison. just as you also remain in the midst of persecution. Since we have formed one body, how can we not be saddened in our innermost hearts? How can we not experience the pain of separation in our human faculties? Names of some of the martyrs killed in the persecutions in 1791, 1801, 1827, 1839, 1846, and 1866, 103 of whom were later canonized to sainthood May 6, 1984 by Pope John Paul II. In a break with tradition, the ceremony did not take place in Rome, but in Seoul. 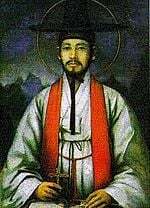 Martyrs from the Gihye Persecution (1839) 기해박해(己亥迫害)In the Gihae Persecution, the French Bishop Imbert and two other missionaries priests, Maubant and Chaston were martyred, as well as Paul Chung Hasang, one of the most successful lay leaders of the Korean Catholic Church, in addition to hundreds of other faithful. Peter Yu Taecheol, a thirteen-year old boy, youngest of the 103 Korean Martyr Saints. Among 8 Catholics beheaded on July 20, 1839, the first group to be martyred after Cho Pyongku issued a decree that the Church be completely eliminated. Killed in the Byeongoh Persecution (1846) Martyrs from the Byeongoh Persecution included the first Korean-born Catholic priest, Andrew Kim Taegon, and nine other believers. Byungin Persecution (1866-1871), sometimes called the Great Persecution, under the rule of Daewongun, was the final and most severe persecution under the Joseon Dynasty. 9 foreign missionaries were killed, along with an estimated 8,000 Korean Catholics. Apostolic Journey To Korea: Mass For The Canonization Of Korean Martyrs. Catholic Online: Martyrs of Korea. This page was last modified on 24 April 2018, at 14:27.